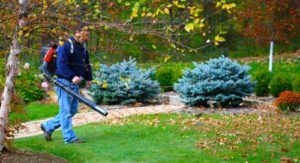 Our spring & fall clean-up service provides the removal of all leaves, branches and other debris from the lawn and planting beds that has accumulated over the course of a season. Old debris left un cleaned can harbor harmful insects and disease which can lead to larger problems for years to come. Our certified staff has 30+ years of combined experience in all phases of landscaping. Our customer focused approach allows us to provide the customer with an experiance second to none. We encourage customer involvement from start to finish. At Majestic Landscapes Inc we realize that improving/maintaining your property is a big investment. Our staff is able to provide knowledgable advice and guidance to help the customer achieve the goals they may have for their property. From new projects to renovations we are committed to providing an aesthetic and functional solution. Be proactive and prepare your yard for the upcoming growing season!